Milwaukee French Immersion (MFIS) is a high-achieving PUBLIC school. We provide English-speaking pupils Pre-K4 through 5th grad e the opportunity to learn French in an environment where French is the primary language of instruction, and we also adhere to aspects of the Wisconsin curriculum and common core. Our 5th-grade students have the opportunity to travel nationally or internationally to locations where they get to utilize their French language in an immersed setting. MFIS has been honored as a School of Distinction for successfully implementing PBIS, a program that reinforces positive behaviors. We offer wrap-around before- and after-school camp, which provides students with extended learning and activity opportunities. Within our program, all students participate in gym, art, music, and African Dance. MFIS students participate in Le Grand Concours; The National French Contest is an annual competition sponsored by the American Association of Teachers of French. Students of French in grades 1-12, in all 50 states and abroad, take a written test and compete against students with similar educational background for prizes. Our students MFIS Students in grades 2-5 may also choose to participate in violin or piano lessons during the school day. Our 4th and 5th grade students participate in the Mad Hot Ballroom and Tap through Danceworks. MFIS was awarded with the first overall trophy. Our Lego League Robotics team competes every fall and has won awards at competitions. Our French theater competes in competitions and receives the highest marks possible. Other extracurricular activities at MFIS include: Coed-Basketball, Spirit Squad, Daisies, Brownies, Junior Girl Scout troops. New students are accepted in kindergarten and 1st grade only; previous language experience is required for entry in grades 2-5. Our Students – We embrace the cultural identities of our student population and the contributions they make to our school community. The diversity of our students is what makes our school beautiful. The French language and culture – We embrace the presence of the French language in the francophone world. We aim to create global citizens through our teaching in French and through the variety of cultural experiences we provide to our students. Collaboration – We aim to reach higher levels of collaboration and we recognize for we are all accountable for our school’s success. We are stronger and smarter when we work together to accomplish our school-wide goals. Continuous Improvement– We will consistently reflect on our current practices and pursue higher levels of teacher expertise. We believe in using a growth mindset in order to grow as professionals. The Milwaukee French Immersion program began in 1978 as a part of court-ordered desegregation. Anthony Gradisnik, Curriculum Specialist for Foreign Languages at that time, had the foresight to research and develop the immersion schools as an alternative to forced busing. He had heard about the success of the Canadian immersion programs and wanted to duplicate this model of foreign language instruction. Originally, the French program was housed at 68th Street School, along with the German Immersion program. 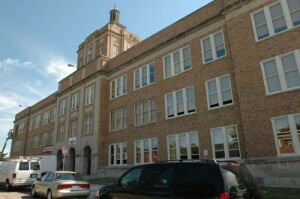 In 1980, the two programs were moved to 82nd Street School, which remains the home of Milwaukee German Immersion. At that time, though, the school was known as 82nd Street Multi-Language School. By 1985, both the German and French programs were growing and needed more space. That, combined with an effort to maintain the integrity of the language within each program, resulted in moving the French program to South 88th Street and establishing for the first time the Milwaukee French Immersion School (MFIS). This move allowed both programs to expand and accommodate more students. Initially, there was one class at each grade level. The move to 88th Street allowed the program to grow at the entry-level grades to include 50 seats at K4, 75 seats at K5, and 75 seats at 1st grade. Those students then moved into 2nd – 5th grade. Due to normal attrition rates, there were typically two classes at each level in grades 2 – 5, often with a 4/5 grade combination class. When SAGE (Student Achievement Guarantee in Education), a program to reduce class size, was introduced in the 2000-2001 school year, 60 seats were available at the K5 and 1st grade levels, due to the student-teacher ratio of 15:1. MFIS has maintained high standards of academic excellence since the program’s founding nearly 35 years ago. However, the remote location of the school on the far southwest side of Milwaukee, along with increased costs of transportation, made it imperative to move to a more centralized location. Since the beginning in the fall of 2004, the Milwaukee French Immersion School has been located at 2360 N. 52nd Street, in the building that formerly housed Steuben Middle School. The relocation of the French Immersion program has allowed for expansion at the entry levels, making 75 seats available at K4, K5 and 1st grade levels. The parents, students and staff of the Milwaukee French Immersion School have continually demonstrated their commitment to this unique program. Many of the staff members have sent or currently send their children to MFIS because of the caring atmosphere and excellent educational program that’s offered. Former students continue to visit and contact the school and keep the staff informed of their successes. Moreover, perhaps the greatest testimonial to our program’s success has been the return of former students to actually join our staff, or sending their own children to the Milwaukee French Immersion School as they have become parents. When the building was built in 1929, it was originally used as barracks for the United States Army. When the barracks became a school, it was named Steuben Junior High School and serviced seventh, eighth, and ninth graders from the neighborhoods surrounding the school. The new building was built in 1932 and opened on September 7th with 1,032 students. In 1971 Steuben’s focus and philosophy changed from a junior high to a middle school. At that time it was renamed Steuben Middle School and began enrolling sixth, seventh, and eighth graders from all across the city of Milwaukee. Milwaukee French Immersion admits students of any race, color, national and ethnic origin to all the rights, privileges, programs, and activities generally accorded or made available to students at the school. It does not discriminate on the basis of race, color, religion, gender, sexual orientation, sexual identity, disability, family situation, socio-economic differences, intellectual or athletic ability, status as a handicapped person, or any other basis that would be illegal, in administration of its educational policies and other school-administered programs.